Serviceberry is a member of the Rose Family. 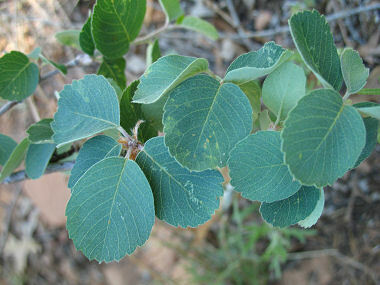 It appears as a shrub or small tree with smooth, gray bark. The plant grows to 15 feet in height and has dark green, round to elliptical leaves with toothed edges to 1.5 inches in length and 1 inch in width. The plant grows on rocky slopes in pinyon-juniper woodlands and ponderosa pine forests at elevations between 2000 - 7500 feet. Hopis used the wood of the Serviceberry to craft bows, arrows and ceremonial prayer sticks. Serviceberry blooms between April - May and produces white flowers with 5 narrow petals that grow in clusters of 3 to 6 to 0.5 inches in width.